William Gowland was one of the many foreign advisors who went to Japan in the Meiji era (1862-1912). He was a skilled metallurgist and was employed at the Osaka Mint from 1872 to 1888. He was also a keen amateur archaeologist investigating some 406 tombs of the Kofun period (about 300 – mid-6th century AD) and surveying 140. 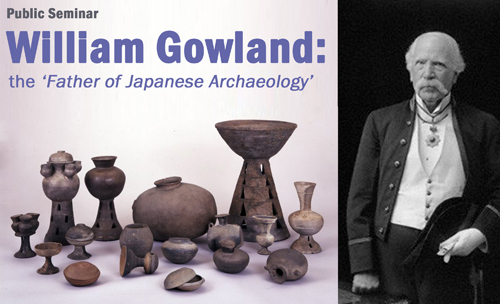 The extent and accuracy of Gowland’s surveys were such that he became known as the ‘Father of Japanese Archaeology’. On his return to Britain in 1888 Gowland brought with him his extensive collection of Kofun-period artefacts. This collection, which is arguably the finest of its kind outside Japan, was later acquired by the British Museum and is now the subject of an extensive survey by a team of Japanese archaeologists.